Memory is inextricable from learning; there's little sense in teaching students something new if they can't recall it later. Ensuring that the knowledge teachers impart is appropriately stored in the brain and easily retrieved when necessary is a vital component of instruction. 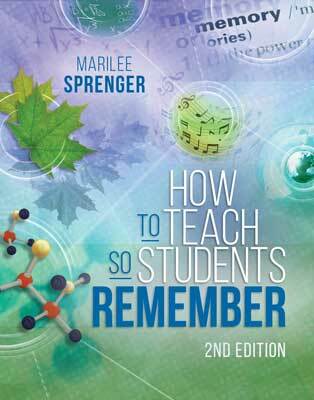 In How to Teach So Students Remember, author Marilee Sprenger provides you with a proven, research-based, easy-to-follow framework for doing just that. align instruction, review, and assessment to help students more easily retrieve information. The practical strategies and suggestions in this book, carefully followed and appropriately differentiated, will revolutionize the way you teach and immeasurably improve student achievement. Remember: By consciously crafting lessons for maximum "stickiness," we can equip all students to remember what's important when it matters. Marilee Sprenger is an international consultant in educational neuroscience, memory, differentiation, reading, and vocabulary. She has authored 12 books on the brain and learning, written numerous articles, and has DVDs, webinars, a quick reference guide, and online courses available through ASCD.